Brown trout and remote water are two things that make Deep Creek one of my favorites in the Park. 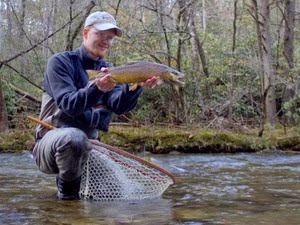 My largest fish in the Smokies came from Deep Creek and every trip there is always good for at least one memorable moment. After some convincing, my cousin Nathan agreed to do a trip with me to #53 in search of the Deep Creek slam. This section of stream is well protected by the rigorous hike in but still sees a fair number of fishermen. I have done this trip as a daytrip, and also I’ve hiked down to #54 from the top. Each time I do this trip, I promise myself that I’ll never pack in overnight again, but I like Deep Creek so much that I just can’t stay away. The section of Deep Creek above the confluence with the Left Fork is characterized by smooth low gradient stretches that are perfect for brown trout alternating with steep sections of picture perfect pocket water containing rainbows and, as you go higher, more and more brook trout. The stream is fed by several feeder creeks between #53 and #54 meaning that as you go higher, the stream is getting smaller fairly quickly. Still, occasional larger pools often harbor better than average brown trout. The trip was motivated by two things. First was my desire to return to upper Deep Creek along with wanting to do a backcountry trip. Second, my cousin Nathan just received a fly rod for his birthday and obviously needed to try it out. This trip was the perfect opportunity to kill two birds with one stone so to speak. Friday morning we both got up later than anticipated so we really didn’t reach the trailhead until around noon. Nathan beat me there, but thankfully we were both completely ready to hit the trail and started hiking as soon as I arrived. Hiking down from near Newfound Gap is the pleasant part of this trip. Hiking back out is an altogether different story. We made really good time, only stopping briefly twice to adjust the shoulder straps on my pack. I was hiking in a pair of Tevas that are extremely comfortable to walk in, even with a 40 pound pack on. This eliminates the need to carry sandals or flip flops for wearing around camp. The downside is the lack of ankle support. Nathan had brought an extra pair of trekking poles for me to try out on this hike, and I must say that I found them useful. The best part of the hike in was checking out the stream along the way. In a favorite small pool near the trail, we spotted a beautiful brook trout waiting for food to come along in the current. This particular pool is well protected by the surrounding vegetation making fishing nearly impossible. One of these days I’ll solve the problems posed by this particular scenario but in the meantime, it is nice to know that the fish will be there again next time for me to watch when I need a breather on the hike in to campsite #53. Upon arriving at #53, we quickly set up the tent and then ran our packs up the bear cables. I wanted to get in some fishing time before we had supper. We hiked a short distance down the trail before jumping in the creek to fish back upstream. It was only a matter of minutes before the first trout hit, and for the next couple of hours, the action continued fast and furious. I managed a slam relatively quickly although Nathan was having trouble finding a willing brown trout. We cut the evening fishing short since supper was going to require some effort and we were both really hungry after the hike down the ridge. The plan was to make hobo stew (lots of different names for these but this is what we’ve always called them). The basic idea for those that don’t know about this delicious camp food is to cook various vegetables in packs of foil over the fire. As I’m vegetarian, mine includes a meatless alternative to chicken that I like. We went with just the basics since we had to carry everything in. The night before I cut and chopped potatoes, onions, and carrots and put them in Ziploc bags. Nathan brought butter and foil. Everything goes in the foil and then after wrapping it all up really well, you put it on a fire. The fire was the difficult part of this whole operation. The forest was soaked from the daily thunderstorms. After a lot of effort, we found enough semi dry wood to get the fire smoldering. After another 30 minutes of blowing on the small coals, we (read Nathan here…I mostly stood back watching and laughing) got the fire roaring. In fact, it was so hot that the outside of the foil was burning off. Nothing I’ve ever ate while backpacking could compare with that incredible meal. The extra weight was well worth it, and best of all, we didn’t have to carry it all back up the hill in our packs. When you’re done, throw the used foil and other trash into the Ziploc bags and everything is clean and ready to pack back out. We let the fire die soon after eating and decided to hit the sack. The next day was dedicated to exploring downstream in search of some larger browns, and we were both tired after the hike in. The next morning I was up early and headed over to the stream to look things over. In one nice pool, I was sneaking slowly along the edge when a dark shadow caused me to pause. 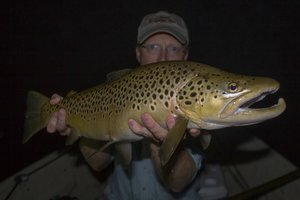 I couldn’t believe such a nice brown was out feeding in such an easy to spot location, but then, I’m used to fishing Little River where the larger brown trout are notoriously hard to find. Apparently the fish was attentive to its surroundings, because shortly after spotting it, the fish noticed me and spooked. Knowing where nice fish are is at least half the battle though, so I was confident that returning later might produce better results. Back in camp, I found Nathan ready to get going. After a quick breakfast we started hiking downstream. We made it down below #54 where we saw another fisherman working upstream. Realizing that it was pointless to fish behind him we backtracked upstream probably a half a mile or more. Entering the stream, I started with a dry as did Nathan. The fish weren’t really looking up so after 15 minutes of fruitless casting, I went back to a double nymph rig. There were lots of bugs hatching so any number of nymphs and wet flies worked well. Caddis pupa patterns were definitely catching fish and an Isonychia nymph soft hackle I tie was also doing the trick. Additionally, we saw good numbers of BWOs in a #20 or smaller, Golden Stoneflies, Little Yellow Stoneflies, and various light colored mayflies that I never could get a good look at but appeared to be either Light Cahills, Sulphurs, or Pale Evening Duns. All of these appeared to be somewhere the in #14-#16 size range. Moving upstream, Nathan soon decided that a dropper would significantly enhance his odds so we tied on a bead head caddis pupa. Immediately he started catching a lot more fish. Once the sun finally came out from behind the clouds, the fish were on his dry fly as well. It was interesting to watch the clouds come and go. Almost like flipping a switch, the clouds turned the fish on and off to feeding on the surface (or at least our dry flies). When the sun went behind the clouds the trout went deep. This is just one of those mysteries that keeps fly fishing interesting. Most places I’ve fished have the exact opposite situation. Clouds normally bring fish higher in the water column to feed on emerging insects. In the mountains the sun often seems to be a good thing though as long as you are satisfied with catching average sized fish. Eventually we were approaching a point where the stream flows through a gorge with the trail far above. The sun was already nearing the tops of the ridge to the west so we climbed out and started trekking back towards camp. I wanted plenty of time to try the spot where I briefly hooked the large fish the evening before and to look for the nice brown I spotted that morning. Getting back into the stream where we started the evening before, I moved rapidly upstream to the hole I missed the nice fish in. I carefully worked every inch with my pair of nymphs but never got so much as a single strike. We got back out of the water and hustled far upstream to the nice pool I discovered that morning. I moved slowly along the bank trying to keep well under cover. Finally I was in casting position but couldn’t see the fish where I expected it to be. Undeterred, I figured it had moved a few feet further upstream to a better lie with the lower light conditions. I checked my tippet and knots one last time before making the first cast. Purposefully I kept my casts short until I was positive that I had the obstacles figured out. Stripping a few more feet of line from the reel, I cast up to where I expected the fish to be. Immediately the line went tight. The boil of a good fish rolling on the surface showed and the fight was on. As the fish turned downstream, I got a decent look and knew it wasn’t a bad fish. After a couple of minutes, I wrestled the fish into the shallows and corralled it by kneeling down in the water to provide a human fence…definitely no last second opportunities for this fish to get away. Nathan came up from where he had been watching and took over the camera duties. 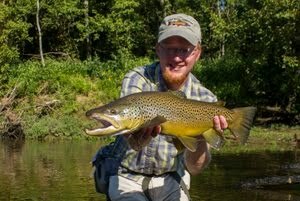 I was thrilled with the 16 inch brown. This fish could be the nicest I catch in the Park this summer so I savored the moment. Finally, I cradled the fish in the current to release it. It only needed a couple of seconds before it bolted away to grow a little more and be caught again another time. The pinnacle of the trip had been reached, however back in camp a humorous episode awaited that would be almost as memorable as the big fish. As we strolled into the clearing, I looked up at my backpack and saw lots of bees flying around. You have to understand that I don’t like bees. I’ve had plenty of bad experiences with all kinds of stinging critters including sitting on a hive (more or less) a couple of summers ago. Upon closer inspection, it appeared that the bees were attempting to take up residence in my pack. I came to this realization about the same time Nathan started rolling on the ground laughing in glee. While he continued laughing, I started to formulate an approach to rid my pack of the bees. Smoke was my first idea so I grabbed a long branch and rigged up an apparatus on the end we could light. After the smoke was wafting upwards on the breeze, I moved for my first attempt at putting the bees to sleep or otherwise encouraging them to head for a different locale. Sadly the smoke idea didn’t really work unless I got my improvised torch dangerously close to the pack. After much discussion, plan B was enacted. This entailed unclipping the pack and running like hell for the opposite side of the clearing while the pack tumbled to the earth. Just before I actually let go of the cable, I wondered if I could lower it so gently that the bees wouldn’t notice the decrease in altitude. Altering plan B proved to be a good solution. The bees were still roaming around the pack though. At this point Nathan finally ceased his mirth, calmly grabbing the pack and carried it to our dinner log. Honey bees are nonaggressive as far as such things go. After another hour of maneuvering around the few bees still hovering around my pack, it occurred to me that they must be after the salt. The last time I used this pack was for the Everglades canoe trip early this past spring. There were bees around my pack, its rain cover, and my tent. All items probably had a fair amount of salt on them. The bees didn’t care for any of Nathan’s gear and that was the final clue to the puzzle. That evening we both had freeze dried backpacker dinners that just require boiling water. I love these meals but they are a bit expensive when there are other alternatives. Again we headed to bed early since we wanted to get out early the next morning. As many of you know, some or all of my summers are usually spent "out west," usually meaning Colorado but also including parts of Utah, Wyoming and Montana. This year is definitely a change of pace for me. Travelling is getting too expensive so I took a summer to stay close to home with a focus on trying out some fishing opportunities I normally don't enjoy enough. So far, I've backpacked into Deep Creek (report coming soon), explored some Plateau streams that I don't normally fish much, and experimented with float tubing local lakes. As the summer continues, I have plans to do at least one more pack trip and possibly two. Also I'll be floating some area rivers as well as heading to upper east Tennessee at some point to fish the South Holston and Watauga. These rivers are not the Green, or Gunnison, or Madison, but it is definitely better than nothing and in fact far better than most people give them credit for. Those of you that pay attention to my list of links have probably noticed that it continues to slowly grow. Lately I have added a few, and I want to specifically mention a couple since they are well worth your time to visit. 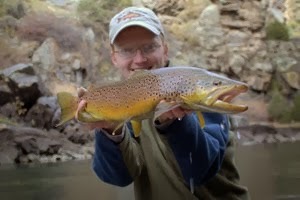 The other blog I've added to the list of links is the Fly Fishing Mind of Jeff Allen. This one is not updated as regularly as the new Blue Ribbon Flies blog, but it is still well worth a visit. In addition to quality writing and good pictures from the author, I particularly enjoy this one because it focuses on the area of southwest Colorado I love so much. 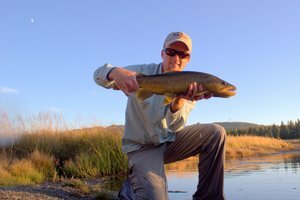 The author regularly fishes the Gunnison (one of my favorite rivers anywhere) as well as favorites such as the Taylor. Since I won't be making it out to fish Colorado or Yellowstone this year, I'll try to live vicariously through these and other bloggers and fly shops that post good reports. In the mean time, I have a Smokies backpacking trip to plan and a Caney fishing report to share. More to come on both of those soon! Spur of the moment fishing trips always have an element of uncertainty. The careful planning that goes into most trips is nonexistent and expectations are usually kept low. After all, when you get a last minute opportunity to get out on the water, the experience is often sufficiently satisfying and catching fish can be a pleasant afterthought. Most of this week has been spent telling myself I need to fish more. Fishing Sunday and Monday apparently wasn’t enough to make up for the recent dearth of fishing trips. What I’m really craving is a good trout fishing trip, but when the nearest trout water is 50 minutes away you simply take what you can get. About three miles from where I live is a small lake that most people would miss when driving by. It is tucked back in the woods mostly out of sight and the entrance is unmarked. However, it is a public lake with a TWRA boat ramp. When I first bought a float tube earlier this year, I envisioned evening trips to this particular lake on a regular basis, but so far those dreams have not been realized. In an effort to start fishing more and begin learning the lake, I decided to drive over last evening to see what was going on. The float tube came out and was soon ready to go. I quickly dug through my fly boxes looking for enough random bass and panfish flies to make the evening a success. Soon I was on the road, happy to be going fishing again. The first time I took the tube out, pre-launch preparations took me quite awhile but this time I was in the water fairly quickly, kicking my way across the lake with a large diving hairbug in tow. The first 20 minutes produced absolutely nothing on the large bassbug so I switched to a small Clouser. Again, nothing happened. While I don’t consider myself a particularly proficient warm water fisherman, I at least like to imagine that I can manage to get by. The first 30 minutes on the water had me wondering if I really truly had no clue what I was doing or if the lake only offered poor fishing. Finally, after kicking across the lake to another shoreline, I snagged my fly within a few feet of the bank and had to work in close to retrieve it. As I moved into the shallows, I saw small bass and bluegill spooking in all directions. Convinced that it must be my method, I decided to try a smaller fly. Out came the fly boxes again and this time I decided to try a small Simi Seal Leech. These simple but deadly flies are some of my favorites for bluegill and small bass and work great for trout as well. Again I started slowly working the shoreline, but other than a couple of bumps, I couldn’t buy a fish. Moving into a cove, I finally discovered one reason that at least some of the fish weren’t biting well. I discovered a large area of bedded fish. There appeared to be both bass and some type of sunfish in this area although I can’t be positive that both were on beds since one may have been raiding the beds of the other. The trip was pleasant and while it would have been nice to catch a few fish, the Mountain Laurel blooming along the water’s edge helped make my effort worthwhile. I still had to get back to the ramp though. The area where I found the large concentration of fish had been rested long enough so I slowly worked my way back. The first cast up against the shore produced a solid strike, and I soon was admiring a small bluegill. Releasing the fish, I quickly caught another, this time a yellow perch. Next, a nice 8” bluegill came to hand. Then the dreaded lull took over. An offering to the fish gods or a weak effort at an interesting camera angle? The evening shadows were growing long and the sun had disappeared below the hills. I decided that one last cast was in order before I called it a day. Most people have more than one "last cast," but I was actually reeling in line after this one. Right on cue, the largest bluegill of the day struck and staged a determined fight. The fish literally hit as I was reeling in the line so I just kept cranking away. The fish fought valiantly, but in the end I was the victor, my reward being a couple of pictures of the nice 9”+ fish. After watching the fish swim off, I started kicking back across the lake. Probably midway back, excruciating pain surged through my leg. “What now?” I thought as a muscle cramp threatened to end my trip while I was still out on the lake. The leg simultaneously wanted to double up and straighten itself out. Balancing my fly rod across the tube, I massaged the tired muscles, hoping to end the misery. Reclining in the tube with my legs sticking straight out, I paddled slowly with my hands, laughing to myself at the absurdity of trying to go anywhere very quickly with my hands as the main propellant. I was making progress though and the thought of standing up to stretch my leg kept me going. By and by I realized that I could kick with the one good leg without going in circles if I was careful. Slowly the pain eased and by the time I approached the boat ramp, I was again kicking gently with both legs. While some people would be worried about going out in a float tube again, I took the muscle spasms as I sign that I need to get out more. After all, the best way to avoid a problem of this nature is to strengthen the muscles involved. Last minute trips always seem to have a random occurrence, it just so happened that this one was quite unpleasant. Maybe next time I’ll make up for it by catching a monster fish.